Pound 4 Pound Rankings are a subject of great debate within the MMA community. Something that has always fascinated me is that everyone that fills out their rankings has a valid point as to why they ranked a certain fighter as low as they did, or as high as they did. For the most part, the rankings are pretty accurate, except when someone decides that a fighter is worthy of top 10 consideration, despite there being evidence to the contrary. What I am trying to say is that fighters who don’t fight top competition each time out, should not be anywhere near this list. Oh, and let’s make something very clear. Cheaters should not be on this list either. Here’s looking at you Sonnen. When you think about the top pound 4 pound fighters, it’s important to realize that these fighters aren’t just the best in their divisions, they are amongst the best in the world. They are a group of fighters with extraordinary talents that have taken not only their games to the next level, but MMA as a whole. Without further ado, I give you the MMA Freak Pound 4 Pound Rankings! Anderson “The Spider” Silva is the #1 fighter on the planet, and he has been for a very long time. Once he steps inside the cage and the door closes, we are mere moments away from a spectacular, highlight reel finish. At this point, I’d pay to watch Silva fight a broom. To tell you the truth, I’d even fight Silva if it meant I’d get to see highlights of another front kick knockout. His last fight against Bonner did a ton of PPV buys despite the fact that Bonner had no chance to win. Silva is a once in a lifetime talent and he doesn’t look like he’s slowing down at all. Enjoy this people, who knows if there will ever be another fighter like him. Jonny “Bones” Jones is the leader of a new breed of fighters; no offense to Erik Koch. Jones constantly makes other good to great fighters look like complete amateurs. He isn’t a black belt in BJJ, but has submitted black belts. He doesn’t have one punch knockout power, but has TKO’d a fair share of opponents. “Bones” has one horrible loss on his record, which in actuality, shouldn’t be there at all. Even Anderson Silva has four losses in his career. When it’s all said and done, Jones could possibly be the greatest of all time. For now, he’ll have to settle for #2 on the pound 4 pound list. Georges St. Pierre makes his highly anticipated return on November 17th after over a year and a half on the shelf due to a serious knee injury. Although his fight with Carlos Condit should be a tough one, it’s not ridiculous to think that GSP is going to dominate Condit. “Rush” is arguably the most well rounded fighter in all of mixed martial arts. The way that he transitions from striking to wrestling is amazing. Once he gets you to the ground, you have to know that you are down a round already. Although he drops down to #3 in the P4P rankings, GSP is without a doubt one of the greatest fighters of not only this time, but of all time as well. Watch UFC Primetime: St-Pierre vs. Condit – Episode 1 in the video below. Jose Aldo, or as I like to call him “Mini Silva”, is another fighter that can go down as one of the best of all time when his career ends. Whether it’s leg kicking Urijah Faber, kneeing Chad Mendes in the face, or landing a flying knee to Cub Swanson to end the fight in 8 seconds, Aldo constantly makes his opponents look like B leaguers. The competition is so slim for Aldo, that fans and the UFC practically begged Frankie Edgar to drop down to featherweight to take that fight. I personally can’t wait for Aldo to go up to lightweight, where I’m positive that he’ll win gold. Aldo is at #4 now, but by next year, he could easily be at #2 or #3. At #5 we have Dominick Cruz, who is as talented a fighter as any other fighter in MMA. His footwork is second to none, so preparing for a fight against him is all but impossible. The scary thing about Cruz is that if he ever developed power in his hands, he would be near impossible to defeat. Dominick is not only one of the bigger bantamweights in MMA, he is also one of the fastest. Cruz is currently on the shelf due to a serious knee injury. When he returns, Renan Barao will be waiting for him. The winner of that fight will undoubtedly be ranked in the top 5. Junior Dos Santos is arguably the hardest hitter in all of MMA. I would put his uppercut right up there with Hendo’s “H-Bomb”, on the list of punches you don’t want to get hit with. Don’t let his personal demeanor fool you, when JDS is in a fight, he is easily the scariest fighter in the world. “Cigano” is a fighter that I can easily see running up an Anderson Silva like winning streak. The crazy thing about JDS is that we are told that his ground game is just as good as his stand-up. With all due respect to Overeem; even if you maintained your elevated testosterone levels, and I gave you Thor’s hammer to use in the fight, JDS would still come out on top. JDS won’t be at #6 too much longer. Benson Henderson who occupies the #7 spot on our list, is at an interesting point of his career. Yeah, he is the reigning UFC Lightweight Champion, but most people thought he lost his last fight against Frankie Edgar. Benson needs to make a statement when he fights Nate Diaz, and I believe that he will. Because of that fight with Edgar, fans often forget how good Bendo really is. He has a good taekwondo background, has exceptional wrestling skills, and is virtually impossible to submit. Benson has long been one of the most enjoyable fighters to watch. There is no doubt in my mind that his best is yet to come. “The Natural Born Killer” Carlos Condit has long been one of the best finishers in all of MMA. Out of his 28 career wins, only 2 were by decision. People that think that Carlos is going to become a boring fighter based on his last fight against Diaz, couldn’t be more wrong. I know that nicknames in MMA mean nothing, but you don’t give yourself a nickname like the one Condit has, and not try to live up to it. Condit is easily one of the most dangerous fighters in the world today. If you don’t believe me, replay his fight with Dong Hyun Kim. Condit comes in at #8 in the P4P rankings based on his body of work, which has been very impressive thus far. 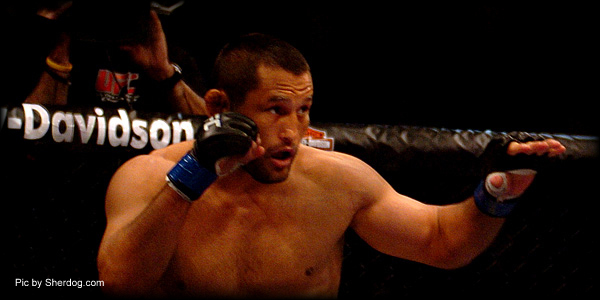 At #9 Dan Henderson is the man with arguably the most dangerous right hand in combat sports. There aren’t many active legends of the sport, but make no mistake about it, Hendo is one of them. Despite not being a particularly big guy, Henderson has won fights at middleweight, light heavyweight, and even heavyweight. Hendo has (T)KO’d four out of the last five opponents that he has defeated. What makes this even more impressive is that Hendo is 42 years old! Injury has kept him stagnant on the pound 4 pound list, but I expect Hendo to stake his claim as being one of the best fighters in the world, when he returns early next year. Rounding out the top 10 is one the most gifted fighters I have ever seen in Renan Barao. Since he lost his very first professional fight, Barao has gone on a 30 fight unbeaten streak, which includes 29 wins and 1 no contest. His last five wins have come against Chris Cariaso, Cole Escovedo, Brad Pickett, Scott Jorgensen, and Urijah Faber. The win against Faber was probably the best moment of his career, because the win made him the Interim UFC Bantamweight Champion. His title unification fight against Dominick Cruz is a highly anticipated fight, and will determine who stays on the p4p list and who doesn’t. Either way, Barao could very well be a fixture on these kinds of lists for many years to come. So, who’s in your Top 10 P4P list?!? I love that Renan Barao made your list, but I still have Gilbert Melendez as my number 10. The only fighter the UFC doesn’t have that should be on that list in my opinion. And even off of two straight losses, how is Frankie Edgar not on your list too lol.